Buying canned goods and extra bags of flour and sugar has been the easiest part of food storage for me. Dehydrating my own food seemed to belong in the same category as spinning my own wool. Yes, it can be done, but why would I want to go through all the trouble??! I found out for myself that dehydrating food is one of the easiest and least expensive ways to stock up. Now, if I say it’s easy, you know. It’s easy! The foods are fresh with no additives of any kind, so I know exactly what my family is consuming. I save money since commercially dried fruits and herbs, in particular, have a premium price at the market. I purchased a NESCO American Harvest dehydrater on Craigslist for $30 one January morning and went to work. I’ve had some hits and misses, but here is what I’ve had the best luck with so far. Easy, easy, easy and so good! Buy #10 cans of peaches at Costco for $5 or so. Pour the fruit into a colander and rinse with water. Lay out the peach slices on the dehydrator trays and dry at a medium setting until the peaches are chewy. These are a great travel snack and will last for years if you store them using a Foodsaver system. It’s amazing how quickly these dry and are ready for storage. I love having jars of fresh herbs and have saved a pretty penny because I no longer have to buy fresh and then need them for a recipe only after they’ve turned slimy. Buy a #10 can of applesauce at Costco for right around $5. Spread a thin layer of applesauce on a plastic tray and dehydrate. When it is dry, you have your own fruit leather! Roll it up, and store. Add cinnamon, pureed strawberries or peaches, or anything else you can think of for variety. My kids love this treat. This is another veggie that spoils all too quickly. Slice, dry, store. Couldn’t be easier! Dried shrooms can even be ground into a powder and added to sauces and gravies for flavor. These are a staple in my soups and stews, and I hate having to run out to the store when I don’t have them on hand. Again, slice, dry, store! One of my camping-crazy friends dehydrates sheets of spaghetti sauce, re-hydrates them with water over a camp stove and has almost-instant pasta sauce. She’s also been known to make hamburger rocks in her dehydrator. It does take time to prepare the fresh food to dry (peel, slice, chop, etc. ), but once they’re on the dehydrator trays and a timer is set, I can spend my time chasing kids and doing laundry. This doesn’t have to be an expensive hobby. Seek out farmer’s markets, produce co-ops, produce stands, and the like to get the freshest food at the lowest prices. Check Craiglist, Freecyle and eBay for bargains on dehydrators. The Excalibur brand is considered to be top of the line, but there are directions online for making your own from scratch. Amazon carries a number of different dehydrators in all price ranges. For more specific how-to details, check out these websites, and have fun dehydrating your own foods! This post was updated from the original posting on June 18, 2009. Dehydrating is a great way to go for preserving foods you can use in an emergency. Great information! Thanks for visiting my blog. You’re a pro when it comes to preserving foods, and I hope my readers will visit your blog, The Practical Preserver. I am saving up for the dehydrator I want right now, but learned SO MUCh about doing it, along with lots of recipes from this site: http://www.dehydrate2store.com This lady doesn't sell anything; she says that she is just interested in helping others prepare in case of emergency. She is the reason I want to buy one. Thanks – that looks like it'll be a really helpful site. I was just reading through your dehydrating posts and I just thought I would let you know that I have started working with my dehydrator. I have a NESCO Professional Food and Jerky Dehydrator. I am also blogging about it too with an article called 'Adventures in Dehydrating' by writing what I am doing and taking pictures of the process. Thought I might record my successes and failures with it. I will definately check out the links that you have posted to help me out. Raven, I'll check out your dehydrating adventures, for sure. I tried making jerky a while back and really made a disaster of it. I should have stopped the dehydrating process earlier but didn't. I went to bed, and when I woke up the next morning, the stuff was about as dry and palatable as those doggie jerky treats! Someone suggested I rehydrate it, and I may try that some day. I also didn't have much luck with potatoes, but now I have quite a few #10 cans of dried potatoes in various forms and really don't need to dehydrate any more. I've had the best luck with herbs, fruit and veggies. Be sure to give frozen veggies a try! I've found canned spaghetti sauce dries very well if it isn't too chunky. Since it's pre-spiced it makes great "backpacking" one-pot spaghetti rehydrating directly in the pasta water. I think you read my mind! Cans of tomato sauce are just 27 cents this week at my grocery store, and I thought of dehydrating several of them for just the reason you mention — rehydrating over a campstove. Great idea! You have inspired me…I just ordered a dehydrator and can't wait for it to get here! You won't be sorry! The next time you look in the fridge and see produce you know won't be eaten, just pop it in the dehydrator, and it won't go to waste. 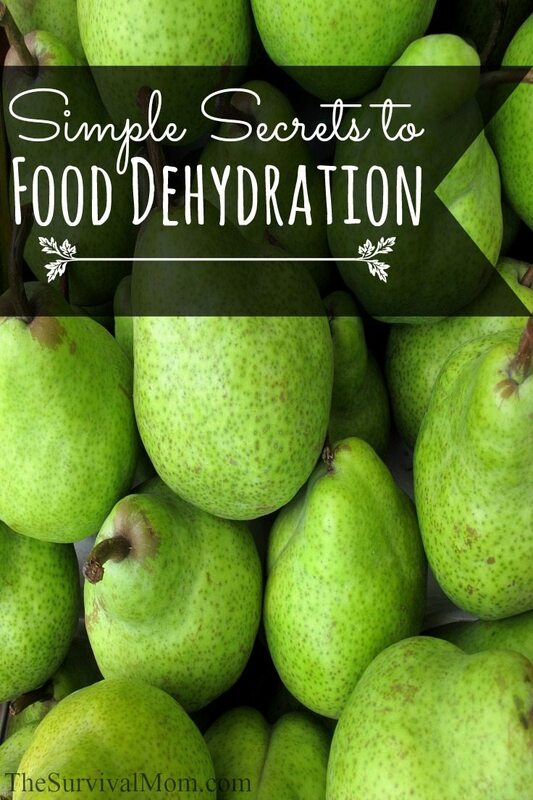 A pretty good resource on food dehydration is dehydrate2store.com and Mary Bell's Complete Dehydrator Cookbook. For me, the important thing is to have that dehydrator either on my counter or somewhere close by. Otherwise, it's easy to forget to actually use it! That is so true. I just discovered that my oven has a dehydrate setting…amazing what you learn by actually reading the instruction manual! I like to buy fresh spinach in those plastic tubs when it's on sale. But, we NEVER are able to finish it before it starts to get slimy. Now, I just dehydrate it, crush it and sneak more veggies into red sauce or add it to a yummy cream sauce for pasta. Mmmm. Probably have to go get a dehydrator now. I have been putting dried rice, beans and peas plus a bullion cube in bags big enough to feed three, then vacuum packing it in a Food Saver. I can open the bag, pour in water and soak until we need to cook it and can eat it without cooling it if you let it soak all day, especially in the Sun. Long Range Reconnaissance Patrols in Vietnam used to hang bags of rice soaking in water tied to their rucksacks for evening meals after a patrol stopped. I use the vacuum pack FoodSaver to pack nuts, dried fruits, bean soups mixes to stock out Bug Out Bags. Also to pack personal hygiene kits with toothbrush, tooth paste, bug spray, dental floss, bar and hand soap, chap stick and small sun screen in bags for our Bug Out Bags. If I have refugees come to my place, I can spare small bags of vacuum packed food – if it makes good sense to let them know I have food. I make Jerky all the time (Vension, Beef, Oryx and Elk meat) and think the best way to make it is in the oven on low heat. I have ready buckets of vacuum packed foods (in ready meal format) to support a truck or vehicle Bug Out, so we don't have to eat out of our Bug Out Bags. Rule #1 for me with the Bug Out Bags are use only if you are on foot. I just posted some information on it at my site. Thanks for the tips on the Dehydrator. Your best bet is to get a dehydrator on Craigslist. I picked mine up for about $30-35. You can see how much you'll actually use it before investing in something more expensive. I have an Excalibur dehydrator and I use it a LOT because it is so easy to use and very efficient. IMO, If I owned a different brand of dehydrator that didn't work as well…I probably wouldn't want to use it nearly as often!! Great to hear. I just purchased an Excalibur dehydrator and am trying to get organized to use the product but don't know how to go about it. I am so glad to have found people who actually have tried the dehydrator and are telling step by step how to do this. How do you store the dehydrated items and in which container? Would like to read more about this since I purchased baking items and tons of canned soups, coffee and stuff. Ok, Thank you. Do I have to be a member? I am not a member now but saw Glenn Beck's show where the Survivourmom was featured. If you found your way to this blog, guess what? You're a member!! :O) (There is no membership, and everyone is welcome.) Feel free to post your questions, comments, and experiences. I got a cheap dehydrator 18 years ago. Use it all the time. To the extent that it is starting to fall apart. Probably should get an excalibur but am satisfied enough I cant see spending the money. Especially since I got another cheap dehydrator free from a friend who was upgrading. Besides for a couple hundred bucks I ought to be able to build a kicka$$ solar dehydrator. Recently came across a neat idea, assume the shtf or teotwawki has happened, so no electricity, (but we are coping because we have preps). How to dehydrate? Use your CAR! We all know how hot a car gets on a hot summer day, right? Adjust air flow with the windows. I dehydrate mushrooms regularly. Sometimes I even get the ones the store that are marked down because they are about to go off. I keep smaller jars like the ones salsa comes in. I put the mushrooms in there. Despite the fact I live where summer humidity is very high I do not have them go off. Perhaps you had them in too large a jar and the repeated opening allowed them to rehydrate from the air. Or perhaps the jar lid did not seal properly. I’d like to start dehydrating foods, but many of the directions say the foods need to be dried for 18 hours or even days. At the same time, you’re supposed to keep turning them. How often should they be turned, and is there a best way or time to turn them so I can still get some sleep at night? That’s the beauty of an Excalibur dehydrator with a timer and temperature/thermostat. My hubby got me one for my birthday this year. It’s got 9 stainless steel racks (hubby does NOT like anything with plastic parts) and I love it! You can almost completely set it and forget it. The only turning they recommend is rotating the trays 90 degrees. I get mine set up so that the last 6-8 hours (or more) is after bedtime, so it can run all night. When I get up, it’s usually ready! One thing that hasn’t been mentioned is “checking” on fruits like cherries, blueberries, etc. It’s like a “flash blanch” to break through the naturally waxy coating on some fruits – generally done before taking off the stems and pitting. I didn’t know about checking when I did my blueberries – thought puncturing all the way through was good enough. Nope – it added hours to drying time. Some of the other dehydrators like the Nesco or Mr. Coffee round ones require you to rotate trays from top to bottom a few times during the process and/or turn the food so it dehydrates evenly. Every time I dehydrate and then go back to use eproduct, it is moldy. I even used oxygen removal pkts. I use an Excalibur. Help!!! My guess is that your foods aren’t being dehydrated long enough AND if you’re in Florida, the humidity may be adding moisture to your foods. How are you packaging them and have you thought of using desiccant packets? I would recommend using both oxy absorbers and desiccant packets in your containers and make sure the food is dried until it snaps when you break a piece in half. Hope that helps. I regularly dry mushrooms, onions, tomatoes, carrots, peppers…. ( I can gets lots of stuff periodically free, so it’s a great way to preserve things when I have way more than I can eat fresh ) I keep everything in the fridge in regular Ziploc bags, together in a basket, so when I’m cooking the whole basket can come out. Keeps everything neat and handy. I’ve never had anything go bad on me. I know you shouldn’t have to keep any of it in the fridge but I feel better about it. I did have some wonderful deer jerky that took on a funny smell after about a year. Since I’d already eaten most I threw the rest out. Maybe it wasn’t dry enough but it did good for almost a year, so I win! I love to dehydrate frozen shredded hash born potatoes. I buy a couple of 30 oz bags when they’re on sale and I get over 2 quarts of dried potatoes to vacuum seal. I just cut open the bags and spread the potatoes out on the dehydrator trays. I have a Nesco with the fan at the top and get about 6-8 trays of potatoes. I process them at about 125 degrees for about 8″ish” hours. They rehydrate in a about 30 minutes, doubling in size. A quick press & squeeze and they ready to pop in the skillet. They’re the only potato I would try to do myself. I especially love the convenience of having them on hand and it’s easy to mix in onion & peppers etc after they’re rehydrated (or you can pre-package them with the freeze dried equivalents and a packet of freeze dries eggs and have breakfast in a bag. We purchased a round dehydrator and 8 trays about 15 years ago. Living in the Rocky Mountains there wasn’t much humidity, yet it was a complete disaster. Even 2 trays would not dry in 2-3 days. At that point I gave up. Fast forward 12 years and I bit the bullet to try again, only with better quality. I purchased an Excaliber and LOVE it!!! We use it all the time when it’s out on the counter. If it gets moved that’s an entirely different matter. We currently live in the highly humid southeast, yet haven’t had any problems. Now my Food Saver is another matter. When it actually decides to vacuum, it doesn’t hold more than a few weeks at most. I’ve dehydrated deer jerky many many times in my electric oven. Just cover the bottom of the oven with foil ( I marinated the strips, so there will be dripping ) and set the temp at the lowest and leave in till dry. Usually takes overnight. I have dried 700 strips at a time because I hang with toothpicks. Why would you empty out cans of peaches and dry them? I can understand drying fresh peaches to preserve them but canned are fine to store. Plus people can eat a lot more dried fruit than they could get through fresh so those 10 cans of peaches won’t last anywhere near as long once dried. Anything dehydrated is much more lightweight than anything canned, so the food is more portable. It’s just another option for people interested in dehydrating food. Dried fruit cocktail is another treat. We are newbies to prepping and a family of seven. How long can dehydrated foods last for, when stored in mylar bags? Thanks for you help. They can last for years but will need an oxygen absorber added to the mylar bag before sealiing. Store all food in cool, dark, and dry locations to lengthen the shelf life. Lisa, I HOPE you find this question! I have an Excalibur 9 tray after reading one of your inspiring articles about dehydrating. What I desperately want to know is: Is there any EASY way to clean the trays and those mesh liners after doing jerky, for example?? Please help. It is SUCH a chore to soak and scrub to get them clean. I am deterred from making more jerky more often(the boys eat it all up in just a few days) due to the absolute CHORE of cleaning those darn things. Pieces of marinade and meat fly everywhere at the beginning of scrubbing it all of, and I am so frustrated. I have even put them all in a cleaned bathtub, let them soak in Dawn Platinum for a few hours, bent over the tub to scrub them, put a filter over the drain to catch the junk, rinsed the sheets in the tub, rinse the tub, scrub the tub, rinse again, clean the filter, then swear I hate dehydrating for this reason only. Any help for me?? Thank you for reading!